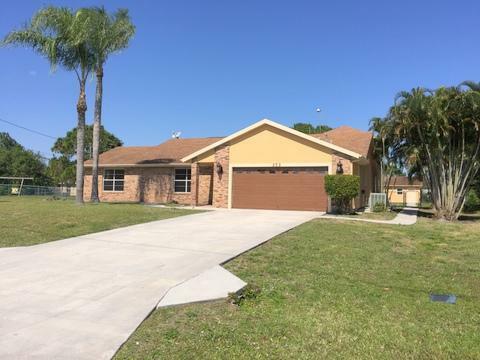 Fresh on the market is the beautiful single family home in Port Saint Lucie, Florida. This home has a guest house too! This gem includes five bedrooms and five bathrooms that is generously laid out over three thousand and three hundred square feet of perfectly appointed living space. The one bedroom and one bathroom guest house is an added bonus to this no home owner's association abode. The brand new custom chef's dream kitchen features a full suite of stainless steel appliances, hand crafted wooden cabinetry and sleek granite counter tops. The floors throughout the main living areas of the home are wood. All the bathrooms feature granite counter tops. The sparkling swimming pool is covered by a screen enclosure. This home sits majestically on a .38 of an acre canal lot. 377 South West Log Drive located in Port Saint Lucie and is currently asking $299,900.00. Residents of Port Saint Lucie have the beach, shopping, dining and entertainment in close proximity at nearby Treasure Coast Square, Sunrise Theater, and Port Saint Lucie Tradition Field. Port Saint Lucie is a great place to watch the Met's spring training. The Palm Beach International Airport is just a short drive for travel convenience.